Miriam Delicado has a big story to blow the whistle on but she needs our help. 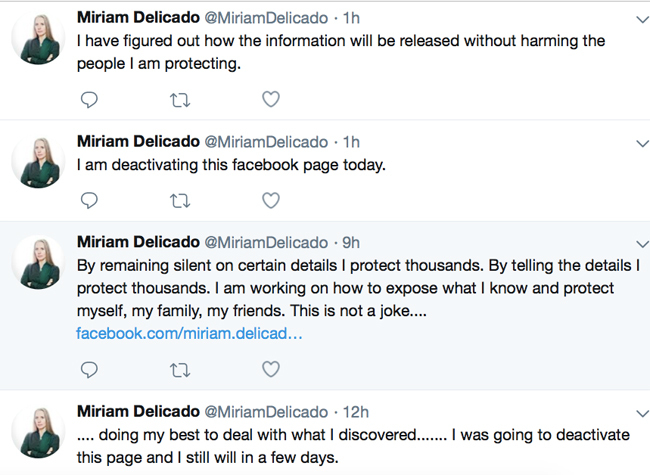 Thread: Miriam Delicado has a big story to blow the whistle on but she needs our help. She has a story that has nothing to deal with spirtuality (The Great Gathering, star beings, etc.) but that she stumbled across “something.” that “nobody wanted her to find”, something that “is really f***ed up. She shared this information with several other people. If you aren’t familiar with Miriam Delicado, she has been interviewed several times by Kerry Cassidy on Project Camelot. Miriam works with tribal groups and believe that all of them have information that they have been holding on to for generations and that the time is coming for them to come together and come forth and bring this information into the open. She has also had some remarkable contact experiences too. Last edited by Kryztian; 1st February 2019 at 18:15. Re: Miriam Delicado has a big story to blow the whistle on but she needs our help. Bless her heart! No ONE should experience anything that should cause them such distress and disgust. What on earth?? I will say I can’t comprehend her wanting to reach out to “The Young Turks”. They are such a sell out dangerous group, what is she thinking? Just the fact they wanted Killary to beat Trump exposes them. Maybe Fade to Black or Coast to Coast or even Alex Jones would be better. Totally felt for her. How awful! Last edited by Soullight; 1st February 2019 at 04:33. Well, whatever the hell it is she saw, we can only speculate at this point. No use trying to pin down what it is. This video will not go viral; she's too "cooky" for the mainstream to accept, and for anything to be viral, it has to be mainstream. Nevertheless, I hope this gets out further. That being said, I doubt having told others what she stumbled upon is enough. If she's in danger, one mysterious accident can easily become 3, 5, 10, or however many know of what it is she saw. Her best bet to get this viral is to get it viral on alternative websites. The 3 you suggested, Soullight, would work. We're likely all on a watchlist just for having seen this. Proceed with caution. Don't do anything stupid. Been there last year and situation ongoing ..
she’s been most probably warned by the “black ops”( who usually look like pretty white ops with nazi overtunes)that her disclosure time is over, her life is to be terminated or got an offer to compromise herself accordingly and even cry publicly for friends to help her out, the handlers of the operation may be physically close and in near total control of her environment for time being. From what I’ve gathered : their primary intention is to intimidate and discredit genuine witnesses and submerge importance of credible data and testimonies. They( whoever is behind the operation) target benevolent , harmless people, including females and children. They’re, at least partially of non-human origin and are guided by brute and deceptive manners. It would be critical that someone with protective force , physical and psychological approach Miriam without hesitation and help her out. While I don’t understand her personal circumstance , the agens movens behind her statement sounds freshly familiar. Post scriptum: they can’t do anything that you’ve not given your soul agreement for, previously. But they can make everything look really bad. there's little protection in verbalising an intention to release sensitive information. sadly, this video can only act as a warning to the possibility of a sudden demise. if there is information to get out there it needs releasing via a third party without a heads up. listening to the content this feels like an alert for vigilance should miriam suddenly die. Last edited by yelik; 1st February 2019 at 10:44. Contacts in media...let me think about it...it’s ok to contact the Guardian for example with important story. It only has to be 99% human. Miriam said it’s not a spiritual story but if it’s at least partially of non-human ( ET) origin any MSM will read her history and discredit the story ( and Miriam). it’s not really advisable to approach MSM. Most certainly talking to more experienced friend in this area would be safer. Why on earth, if you have information that she feels is so important that someone would kill her over would you get on social media and ask for help finding “really, really, really, high level people in media.” to disseminate this information? That absolutely defies common sense. Wouldn't you do that discretely? Although she seems really sincere, she is either lacking common sense or her desire to gain more followers has taken precedence over her safety or she is a great actress. Well, if Kerry or Miriam are ever checking into Avalon (Kerry is still a member here) then quite possibly someone like Glenn Greenwald at The Intercept may be a good person to approach initially. Remember, it was he and Laura Poitras who were selected by and approached by Edward Snowden, in confidence, which eventually resulted in Citizenfour and the NSA exposés. Miriam mentioned talking to "The Young Turk" (a.k.a. Cenk Uygur ). Like everyone else in the MSM, this guy occasionally has good information, but I am pretty sure he is going to be absolutely not open to what ever she has to say. First, he is going to want other information to collaborate what ever it is, second, he is going to vet her and see that she has talked about her E.T. contact experiences and that will make her no longer credible, and third, even if by some miracle he 100% believes her story there are too many people in the newsroom that will talk him out of it. I've heard stories of people trying to get Amy Goodman of Democracy Now on to 9-11 truth. She listens for a bit, then gives them one of fawning concerned looks like "you need to be medicated, you poor thing" and politely ends the conversation and walks away. There is a reason these people have achieved these media positions, and it is because they can not be open to certain stories that involve the paranormal or anything too conspiratorial not out of the normal realm of topics they discuss. Even if they don't just care about themselves, they have too many stories that they feel are credible they still have to get out and they aren't going to stick their necks for just one story from someone who is just to "woo" for them. I would strongly urge her to contact Kerry Cassidy who has a pretty large following in the Youtube/podcast world. Firstly, she will get the message out immediately (she won't have to take time and vet her) and enough of us will know to keep an eye out for Miriam. There are main stream journalists who read what is on this forum and follow Project Camelot too, and one of them might then venture into the story and bring it into the edges of the media. If she is onto a real story, there will be other witnesses and other information to support it, and it can get into the mainstream, it just takes time. A good way to get offed is to say you have some high level information and then sit on it. If you have some high level information then send it out there post haste. "The Young Turk" (a.k.a. Cenk Uygur ) is in my humble opinion changed to a sell out & a shill! ... Do NOT Trust him anymore. He was good when attacking Bush & Wars etc. (The Good Old Days). What she does can/could be counter productive ... if she uses her own intelligence & strategy to spread key info all over the place without warning plus this video at the same time .. THAT would be real protection! ... Now if anything happens we still do not know why! ... I sincerely hope am wrong by the way. I'm backing this up. Cenk Uygur is a sell out schill, he is attacking and advocating the censorship of Alex Jones and he has been attacking Dinesh D'souza and blow horning D'Souza as a criminal when D'Souza was the victim of an Obama weaponized FBI and anyone unable to see that is someone who doesn't want to see it. Cenk Uygur the "Young Turk" is as much of a mainstream sell out as CNN and is obviously on that payroll. I can't link right now, but on her twitter and Facebook page she says she protecting thousands by not sharing certain details and by sharing details. Why only thousands? There are billions of people in the world. I don't know anything about this lady, but I wonder how you stumble onto something as serious as she says it is. I do believe her. Interesting twitter post from January 14th. she says she protecting thousands by not sharing certain details and by sharing details. My best guess: Miriam does a lot of work with native/indigenous/tribal people - people who have wisdom traditions to pass down, people who practice shamanism, people who have made some form of contact. I believe she is based out of Vancouver, although, I am not sure. She probably goes to a lot of Indian Reservations. Reservations have some status as being "autonomous" and not always subject to the same laws, and the same investigation processes, and for that reason, a lot of dark operations (corporations, factions within the CIA, etc.) sometimes like to utilize reservations, for example the Wackenhut Corporation conducted operations at the Cabazon Indian reservation near Indio, California to smuggle weapons and drugs into the U.S. It's my guess that the "thousands" are the population at a reservation. I don't know how to present this in a manner that is not offensive, so I will just present it. I've never been able to extract the relevance of Miriam Delicado, If someone could tell me why she is relevant and or why I should go ahead and listen/endure one of her interviews I would really like to hear it. I've tried a few times to listen to Delicado and there is something about her that honestly repulses me. I for the life of me don't really know what it is, but listening to her is a combination of irratating, kind of like nails on a chalkboard and boring, kind of like watching paint dry, except I one time had a job that entailed watching paint dry and it was more entertaining than Delicado. So, in all earnestness I appeal to those who have watched, listened and digested her information and can tell me why I need to push forward regardless of the personal discomfort it may cause me and work to attain the knowledge she may be able to offer. 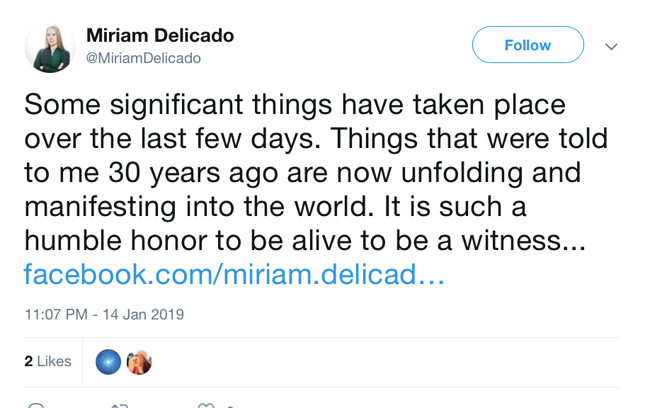 In her Twitter feed, Miriam Delicado mentioned she was with the Hopi people about two weeks ago. The Hopi reservation is in North Western Arizona and is completely surrounded by the Navaho Reservation. It is home to just under 7,000 persons.